Nancy welcomes worshipers to the 8:15 service on a recent Sunday morning. Although she believed that it would never be said of her, Nancy was an abused woman. For seven years she had lived with a man who started to abuse her not long after their relationship began. He was charming at first, showing her the admiration and good times she’d been missing. But in a moment of anger—when their shared dream for a carefree life together had begun to crumble—he hit her. Almost immediately, he was sorry and promised it would never happen again . . . but it did. In the years that followed, what should have been unthinkable was first forgiven, then tolerated, and eventually expected. Nancy’s world, defined by the whims of her abuser, got smaller and smaller. People stay in abusive relationships for a variety of reasons. Nancy stayed, in part, because she had nowhere to go. An even greater factor, however, was the guilt and shame that caused her to feel as if she may have deserved the abuse. The two had first met in a work setting. Nancy, for many years a stay-at-home mom and part-time student, had recently reentered the workforce. While raising her kids, she had earned a bachelors degree but had no real career plans until a friend recommended she consider a job selling advertising space in a magazine for and about the auto industry. Nancy quickly discovered she had a natural talent for sales. “I made a lot of money in a very short time,” she said. “I had power. I had people praising me. And when you’re a stay-at-home mom, you don’t get that. “I was dressing up and going out. I was being noticed. It was about the time I was turning 40,” she remembers, “and it was a perfect storm. “One afternoon,” Nancy recalls, “someone said, ‘Hey, why don’t we all go out for a drink after work?’” That invitation marked the beginning of a new chapter in Nancy’s life—one in which drinking and partying increasingly became the norm. Out-of-control drinking was just the first of a series of bad decisions for Nancy. Not long after, she violated her wedding vows, eventually leaving her husband and three children—then in high school—and heading for what she and her new partner dreamed would be a better life in Las Vegas. From a human perspective, Nancy’s story of seduction by money and attention seems almost understandable, but what makes her tale particularly surprising is that as a teenager, Nancy had become a follower of Jesus Christ. Born in Korea to a Korean mom and a German-American father—a career military man—Nancy came to America at the age of five, settling in Milwaukee, near her American grandparents. There were no strong religious influences in her childhood, Nancy says. Her mom was a non-practicing Buddhist, and her dad had no interest in religion. Nancy’s first glimpse of spiritual things came at age seven or eight, when she saw her American grandpa kneeling in prayer. Having never seen an adult do anything like that before, and fearing he might be dying, she walked over and asked him what he was doing. Her grandpa explained that he had been talking to God—the One who made everything. That encounter introduced Nancy to a personal God with whom a person could have a conversation. Later, when a friend invited Nancy to a summer Bible club, her knowledge of God and the Bible grew, but it was several years later that Nancy made the decision to become a Christ follower. Along with her sister and her mom, she had begun attending Korean-language services at a local church. Her mom came to enjoy the service in her native language, but Nancy and her sister got very little out of it, until one Sunday when a boy who knew the girls invited them to visit the church’s English service. It was there that Nancy first heard and understood the Gospel and made the decision to follow Jesus. She was baptized when she was fourteen, and was active in the church for a while but says she was “among the casualties” when she walked away during her late teen years. It’s been great, she remembers thinking. Thanks for everything, God, but I’m going to have some fun now. It was only after she married and had kids of her own—three within just a little over three years—that she decided to go back to church. She soon became an active member of the small congregation. But while she was very involved at her church for a number of years, there came a day when she walked away again, this time questioning the value of all the time and effort she’d been putting into church activities. No one really had answers to the questions that troubled her: Why were they doing all this? What difference was any of it making? “One day I just said, ‘I’m done,’” Nancy recalls. “I was mad at God. “It was many years later that I realized how prideful and arrogant I had been. I was mad because I had the wrong perspective on what the church was supposed to look like. I realize now that every person I meet in the church is at a different level of maturity. Some don’t even know Christ yet. Just because they’re physically in the building doesn’t mean anything. Nancy’s disillusionment with church and her anger at God didn’t immediately translate into seriously bad choices, but when temptation came, nearly seven years later, there was no faith community to challenge her, no moral compass to guide her steps, and no vibrant personal relationship with Christ to protect her heart. Almost from the beginning, Nancy’s Las Vegas adventure was a disappointment. “Nothing happened as I had anticipated,” she said. Her partner’s charming, carefree attitude that had seemed so attractive earlier in their acquaintance quickly became exasperating to Nancy as the two tried to build their new life together—each leaving behind a spouse and kids. “Nothing we talked about ever materialized,” Nancy said. Money problems and other tensions led to the first incident of domestic violence, which occurred soon after they arrived in Nevada. Nancy’s response could best be described as stunned disbelief. What has gotten into him? she wondered. What did I do to cause that? That episode set a pattern that would be repeated again and again over the years: his abusive behavior, her walking away but eventually returning (after all, she had nowhere to go), and smoothing things over until the next time. Meanwhile, facing a growing need for income, they developed a home-based catering business that focused on providing meals to sales staff at auto dealerships. He assumed that because Nancy was good in the kitchen and could organize well, she must enjoy that work—but that was not the case. She has no fond memories of trying to create hundreds of meals on a tight schedule without the necessary tools and equipment. Even so, the catering service was somewhat profitable, and not long after, they decided to sink Nancy’s life savings into buying a restaurant. Nancy had no delusions that it would be easy. She had seen how hard it is to run a restaurant when her parents were in that business during her growing-up years. “He had no idea how to run a business, and things went from bad to worse,” Nancy said. Before long, he lost interest in the restaurant and took a traveling sales job that left Nancy to struggle on alone. That restaurant kitchen became a symbol of all that was wrong in Nancy’s life. Away on a sales trip, he suffered a major stroke, and in the months of nursing him back to health, Nancy lost the business—and her savings along with it. In the meantime, he decided to move near his family in Illinois as he recovered, so Nancy packed their belongings in a rented truck and brought them to the Chicago suburbs. It was a new place, but in spite of Nancy’s hope that things would be better, nothing was new about the dysfunction, the tension, or the abuse that resumed almost immediately. As the relationship continued to deteriorate, Nancy’s sense of being trapped and powerless grew. Time for a Change—but How? In the late spring of 2013, Nancy woke up to the reality that something had to change. “I knew this relationship was dead. I couldn’t come up with another lie to tell myself,” she recalls. “But even though I was good at coming up with plans, I knew there wasn’t a plan in the world that was going to get me out of this. Recognizing her need, Nancy’s mind went back to Old Testament stories about the Israelites and times when they needed to be delivered from their enemies. “What did Israel do? What were the conditions? What were the circumstances?” she asked. “As I studied the Scriptures, it was clear that it all comes down to confession and repentance. “So that’s what I did. It’s all I knew to do,” she said. For five months, in a journey all alone and away from the outside world, Nancy talked with God. It was an intimate experience, she says, with God and God alone, purging her soul. Still living in an apartment where her presence had been nearly erased, where it was required that all her possessions had to be kept out of sight—kept in two stacked laundry baskets in the bathroom closet—Nancy continued her journey of confession and repentance. “On October 24, 2013,” she said, “he hit me for the last time. Before that, it would happen, and I would walk away, and when I removed myself, it would stop. But this time he followed me—cornered me—and I had nowhere to go. Things were progressing. It was getting worse. “Normally when these things happened—every few months—he would throw me out, knowing I had nowhere to go, so I’d have to come back. I’d have to apologize. “That night in October, I was just out of there, with no money, no car, no glasses, because he had broken them. I walked down from the third floor with my two baskets—and no idea of where to go. I just sat down on the bottom step. “I wasn’t even seated long enough to think, Okay, what am I going to do now? when someone touched me on my shoulder. It was dark. I couldn’t see who it was, but it was a gentle touch. “A woman’s voice said, ‘Nancy, come with me.’ I turned and there was a neighbor I had met a few times. One time I’d driven her to a doctor’s appointment when she needed a ride. We had never had coffee or anything, but as we rode along that day, she told me that she had been a victim of abuse. Nancy stayed in that neighbor’s apartment for four days. No one had any idea she was there, but while she stayed there, the woman pulled out an envelope containing contact information for the people who helped her when she’d been abused. “On Monday morning I called a domestic-abuse hotline that connected me to the shelter where I lived for the next six months—for many weeks so shattered, so oppressed, that I couldn’t look anyone in the eye,” Nancy said. It was after she had been in the shelter for some time that she happened to glance at herself in the mirror. It stunned her as she realized that it’d been years since she had looked at herself. Now she understands that in that circumstance she was so much in denial—so desperate to not see things as they were—that she always looked down. Even on the rare occasions when she ventured out of the apartment to walk along the street, she never looked up. She had no idea, she says, how disconnected she’d become. 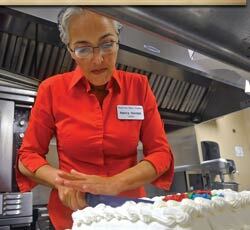 Preparing and serving meals and snacks is just one of the ways Nancy serves at WBC. “I can’t even remember what happened my first week at the shelter,” she said. But she knows that she walked in with nothing but her two laundry baskets and began rebuilding her life from scratch. Part of the process was working with a job counselor to find a way to support herself. Job hunting today is typically computer based, but Nancy’s only access to a computer was at the local library, so she’d head off each day to work on her résumé, with a flash drive provided by the counselor. One morning a library employee, who saw Nancy there day after day, asked her if she was looking for a job. When she said she was, the woman handed her an application. 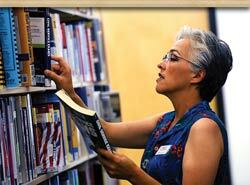 Soon after, Nancy was hired as a book shelver. And before she received her second paycheck from that job, she was invited to apply for a better position with significantly higher pay—even though she had never before worked in a library. 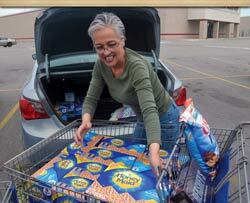 Nancy sees God’s hand—His miracles, His goodness, His faithfulness, His intervention, and His provision—in her rescue by a neighbor, in the provision of safe living accommodations at the shelter, in jobs that came to her before she even knew they were available, and in numerous other ways. 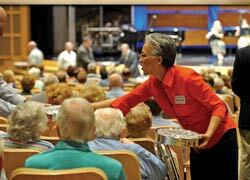 Most Sunday mornings you’ll find Nancy among the ushers at the 8:15 service. Nancy also sees God’s hand in making it possible for her to purchase a new pair of glasses, and in how He used that transaction to introduce her to Wheaton Bible Church earlier this year. Through the shelter she received a voucher from a local Lions Club that enabled her to obtain the new glasses from an optical store in Stratford Square Mall. Another customer, also trying glasses, engaged Nancy in conversation. Nancy doesn’t remember exactly how their chat progressed, but it started as both were trying on various frames. “What do you think of these?” the woman asked Nancy. As they talked, at some point the subject of church came up, and the woman began to tell Nancy about her church, which wasn’t far away, on North Avenue, just west of County Farm Road. Nancy had already been thinking that she needed to find a church, and that conversation led her, some weeks later, to a Sunday morning service at Wheaton Bible Church. On that first Sunday, no one would have guessed that her attractive clothing had been carefully selected from the offerings of a charity’s thrift store. Or that the place she called home was a domestic-abuse shelter for women. But none of that stopped Nancy from stepping directly into the life of the church. At the class, Nancy learned about the church and met several members of the staff, including Volunteer Coordinator Angie Roberts. As she talked with Angie, Nancy asked her what kinds of volunteer needs there were. Her reply nearly floored Nancy as Angie mentioned that one of her top needs at that moment was for someone to coordinate the meals for the Tuesday-evening Place4You women’s Bible studies. Angie explained that many women come to the church straight from work or other responsibilities, so being able to have their supper before the study is both a great convenience and an opportunity for fellowship with other women. Nancy didn’t go into that with Angie that Sunday morning, but she did ask for a little time to think about it. “One of the things I’ve worked on with my counselor is to not always answer right away,” Nancy explained. “I used to say yes to everything. But I have learned that you don’t have to come up with an answer right away. So I told Angie I’d get back to her. “What I knew was that I didn’t want to do that kitchen thing,” she said. “So I’m agonizing over it, and as I did, a Bible verse came to mind: ‘We know that in all things God works for the good of those who love him, who have been called according to his purpose’ (Romans 8:28). That’s a big, bold statement—but I came to see that verse come to life for me. “What I heard God telling me in that situation was, I want to show you, Nancy, how I can take all the threads of all the ugliness and make them into something beautiful—better than you could ever imagine. You can’t picture this. You have no idea. You couldn’t plan it. But I’m going to take what was ugly, and I’m going to weave it into something beautiful. And that beautiful thing is going to be for your good, and it’s going to be for My glory. So are you in? “What I’ve come to understand,” Nancy said, “is that no matter how ugly that painful thread is—and as far as I can see, it doesn’t matter whether it’s a self-inflicted wound or an ‘innocent bystander’ wound—God can make something beautiful out of it. Nancy’s job at the Addison library is just another provision, she says, that God has made for her—another example of His goodness and His faithfulness in her life. Nancy doesn’t know a lot about what’s ahead in her life, but right now she knows that what she’s supposed to do is serve. “The Lord Himself has promised to deliver me from myself,” she said. “Not just to change my circumstances but to change me. “And I don’t believe that He wants to just put duct tape and a Band-Aid on my life,” she said. “It’s going to be a total transformation. All I need to do is to keep my eyes on Him, not think about anything else. And I can do that because I’ve read the end of the Book, and in the end, He reigns! Not long ago, Nancy was asked on video why she serves as a volunteer. 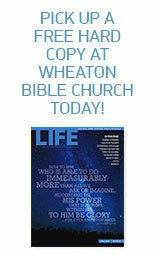 “What I told them is that what we do for God doesn’t have to be sensational to be significant. You don’t have to be a theologian to be in service to God. But what I do know is that just doing what I know—doing the one thing that I could hardly stand to do—has resulted in so many blessings flowing into my life. “Problems are going to come,” Nancy acknowledges. “I’m not always going to feel as ‘protected’ as I do now. That’s normal. But whatever happens, I will know that it’s already been filtered through His love. It’s for my good. And for His glory. One of Nancy’s greatest blessings, she says, it that she has been able to reconnect with her three children, now all in their 20s. A special joy for Nancy was when her daughter, a pastry chef, was excited to help her plan a dessert reception for the Bible study ladies a few months back. “I told her what pans I had available and how many people would attend and said, ‘What do you think?’ and she gave me her ideas. If I had not been serving with the Place4You meals, I wouldn’t have been able to have that kind of connection with her. “I could not dig my way out of my mess, no matter what. But God is faithful, and when we are repentant and broken and humble before Him, then we free Him to do what He’s always wanted to do in our lives. The healing and grace He gives are so much more than we deserve. “None of this is because I’m God’s favorite or because I’m special in any way whatsoever. I’m not. I left my family,” she said. “I had an affair as a married woman, and I deserve everything that came afterwards. Yes, that’s true. This entry was posted on October 13, 2014 by Wheaton Bible Church in Fall 2014 and tagged abuse, Begin class, Place4You, transformation.